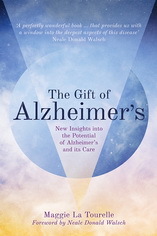 This blog explores the issues raised by the book, The Gift of Alzheimer’s, by Maggie La Tourelle. The book documents a heart and soul journey with my mother who had Alzheimer’s. It deals with the vicissitudes of Alzheimer’s, seeks meaning in the language and demonstrates the healing power of love. Relevant comments are welcome, see below.